Human error was the cause behind a barge owned by Southern Towing Company, headquartered in Memphis, Tennessee, spilling liquid fertilizer into the Ohio River in Cincinnati Dec. 19. 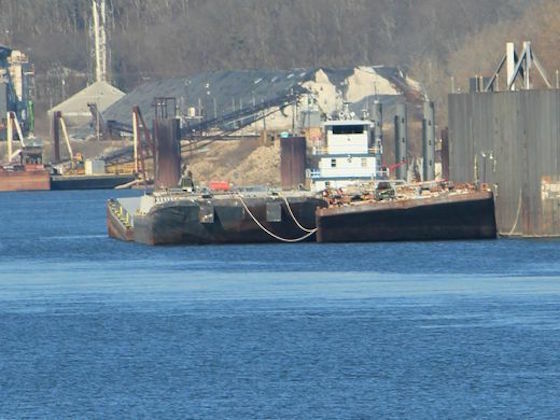 Human error was the cause of a barge cracking in half and releasing 467,000 gallons of fertilizer into the Ohio River this past December, officials said. This new information ended up released by the company, Southern Towing, at the request of the state of Kentucky, which issued three environmental notices of violation against the Memphis, TN-based company for the spill. A tankerman unloaded the liquid fertilizer on Dec. 19 in a way that the weight became concentrated in the middle of the barge, causing it to buckle, company officials said. As a result, hundreds of thousands of gallons of fertilizer released into the river, dissolving into the current, and headed for Louisville. In response, water sampling began almost immediately. Scientists found higher than normal levels of ammonium and nitrogen, ingredients of the fertilizer. As the plume floated by, Louisville Water Co. closed its drinking water intakes to safeguard the city’s water supply. There was seemingly no large losses of aquatic life, but local scientists who work on the river expect the chemicals caused the deaths of some fish and freshwater mussels. Kentucky issued three notices of violation to Southern Towing in January for discharging pollutants and degrading the waters of the commonwealth. It ordered the company to answer questions about what happened and how, as well as the company’s plan to keep it from happening again. In a Feb. 21 response letter back to state authorities, Southern Towing denied it violated Kentucky’s water statutes. The company didn’t state why. It did, however, offer answers about what happened and what steps the company has taken and will take to avoid a similar situation in the future. Personnel disciplinary proceedings took place, according to the company’s letter. But it did not say to whom any discipline was doled out. The company made “changes with laser-focused supervision and vessel oversight,” its lawyer wrote. The state of Kentucky has the ability to fine Southern Towing, with each violation carrying potential fines up to $25,000 a day. It has not yet determined whether fines are appropriate, according to John Mura, spokesman for the Kentucky Department of Environmental Protection.